The IBM® DB2® pureScale® feature offers clustering technology that helps deliver high availability and exceptional scalability transparent to applications. The DB2 pureScale feature helps you to meet your business needs around availability and scalability, and is also easy to configure and administer. 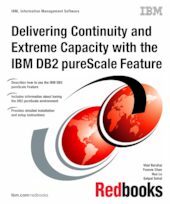 This IBM Redbooks® publication addresses the DB2 pureScale feature that is available in IBM DB2 10.1 for Linux, UNIX, and Windows operating systems. It can help you build skills and deploy the DB2 pureScale feature. This book bundles all the information necessary for a in-depth analysis into the functions of the DB2 pureScale feature, including the actual hardware requirements. It includes validated step-by-step hardware and software installation instructions. In addition, this book provides detailed examples about how to work effectively with a DB2 pureScale cluster and how to plan and run an upgrade for all DB2 related components to DB2 10.1. This book is intended for database administrators (DBAs) who use IBM DB2 10.1 for Linux, UNIX, and Windows operating systems who want to explore and get started with the DB2 pureScale feature.